Monday night for dinner Adelaide Food Central was invited to the new restaurant Bai Long Store, located on Hutt Street in the city. I was really excited to sample their menu as I am a huge fan of their sister store Gin Long Canteen. Not only do they offer dinner but also a brunch menu which Adelaide Food Central were lucky enough to sample a few weeks ago. Jerry introduced us to their interesting and unique menu, that we thoroughly enjoyed. The restaurant itself has a really unique modern Asian feel and I loved the white and black theme that they used for their interior, cutlery and furniture. 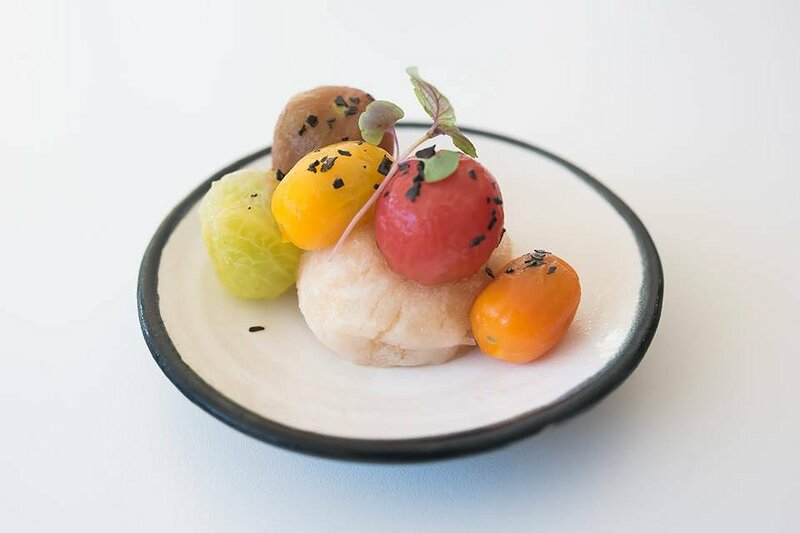 The first small dish we tried was the Baby Tomato with thai basil granita. What an interesting little dish this was, some small tomatoes sitting on a bed of icy granita. The granita was by far a highlight of the evening as it burst with authentic flavours with a frozen twist. We were excited to find out that the granita alone is actually a dessert on their menu, which we were hoping was the case. It was a great palate cleanser and perfect for an after dinner treat. Second entrée was the Sashimi with market fish, truffle soy and micro shisho. I am a sucker for sashimi, so I was ecstatic when this dish came out looking immaculate and of course tasting delicious. 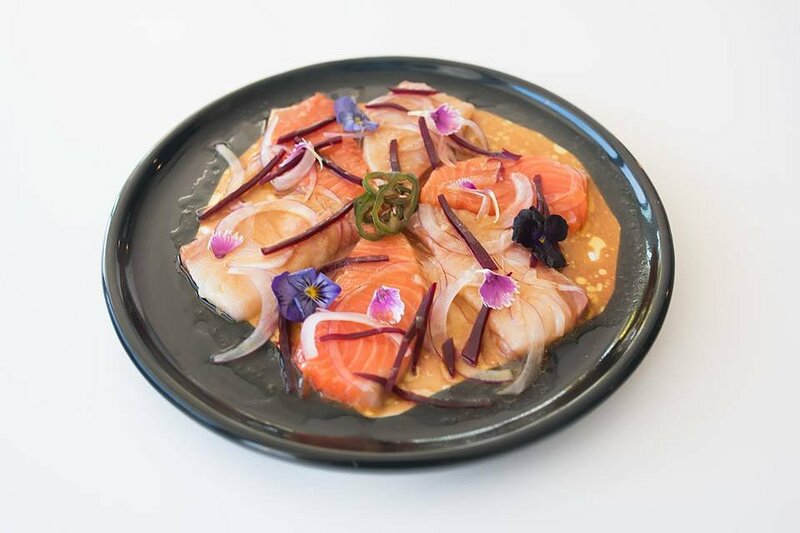 There was a mixture of both kingfish and salmon sashimi, coasted with a subtle truffle soy and micro shisho which paired perfectly with the fish. I have never particularly liked sashimi when it is coated with sauce, the simpler the better, but it is safe to say that this was one of my favourite sashimi dishes yet. Now onto the delicious Crispy Chicken with spicy tomato, peanut and spring onion. 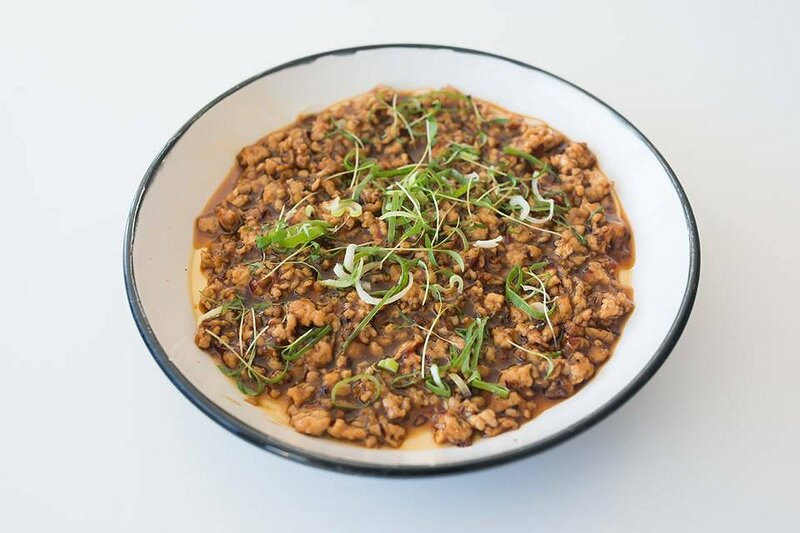 You know that delicious fattening sweet and sour pork you order at a Chinese restaurant, well this dish is a take on that, but with chicken. Scrap sweet and sour pork, this is my new favourite, better than anything you will try at a Chinese restaurant. 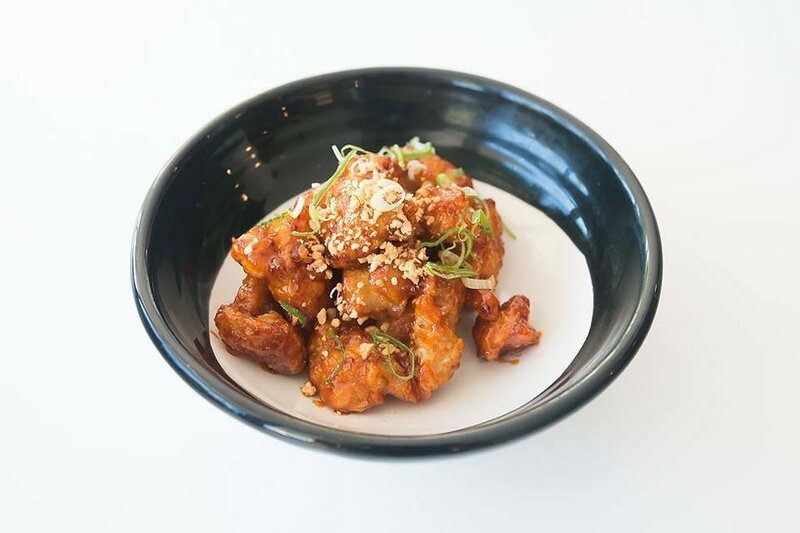 The sticky sweet and sour sauce was not to overbearing and the crunchy batter coated the succulent chicken with just the right amount of flour. The chicken itself was good quality, which made the dish that little bit more impressive. Another of the smaller dishes was the Gyoza with wagyu beef and ponzu sauce. 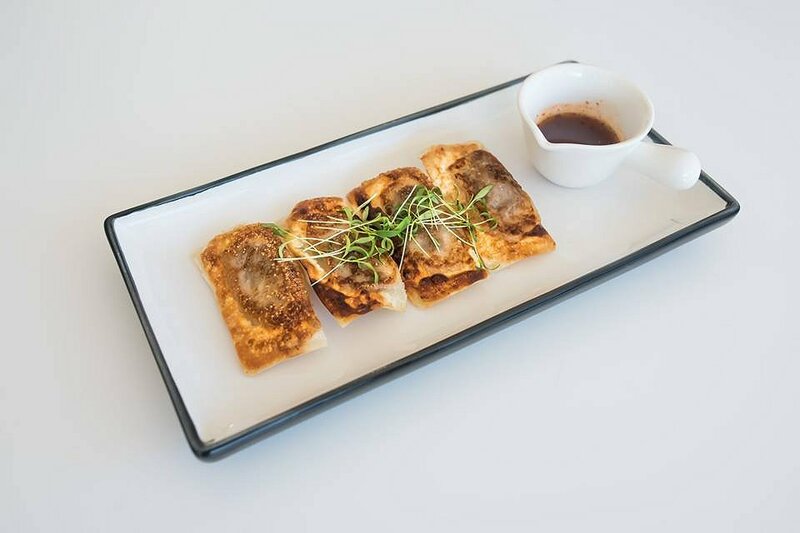 My favourite part about this dish was the outer crunch of the gyoza, as it had been prepared to perfection. As you came to the middle it got slightly softer, which led to the juicy wagyu beef filling. The chunky meat flavour combined with the crisp outing led to a beautiful and flavoursome entree. The final entrée dish was the Octopus with yuzu papaya, nori dust and watercress. 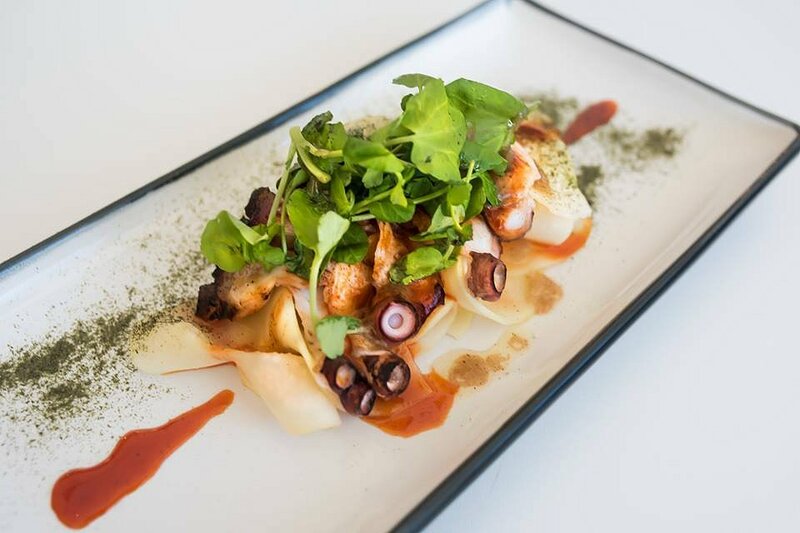 I was intrigued by the flavours that were presented to us in this dish, and it was quite different to octopus that I had tried before. This octopus had a squeaky consistency and we could tell it was good quality. The papaya had an almost chewy/crunchy texture and let out flavours of both sweet and sour. It was definitely an interesting combination but the textures and flavours worked effortlessly. We then went onto some larger plates those being two types of Mapo, vegetable and chicken. Both dishes were extremely unique, like nothing I had ever tasted before. I was almost expecting a stew like consistency but when I dug my spoon into the dish I was presented with soya egg custard, what a pleasant surprise. Placed on top of the custard was a mix of vegetables and the other chicken, both toppings filled with extreme flavour and authenticity. This dish was like nothing I had ever tried before, which shows how genuine the food really is. Next up was the Tartare – beef, quail yolk, infused apple. Beef tartare has seemed to be popping up on many restaurant menus that I have visited lately, so it was very important to me that this dish was prepared to a high standard. It was safe to say that I was very impressed with the way this dish was executed. The beef that was used was high quality, with an addition of garlic and herbs. The tartare to me tasted like the Korean dish bulgolgi, which is a favourite of mine. The subtle apple flavour along with the runny, yellow egg yolk was a perfect accompaniment to the beef. 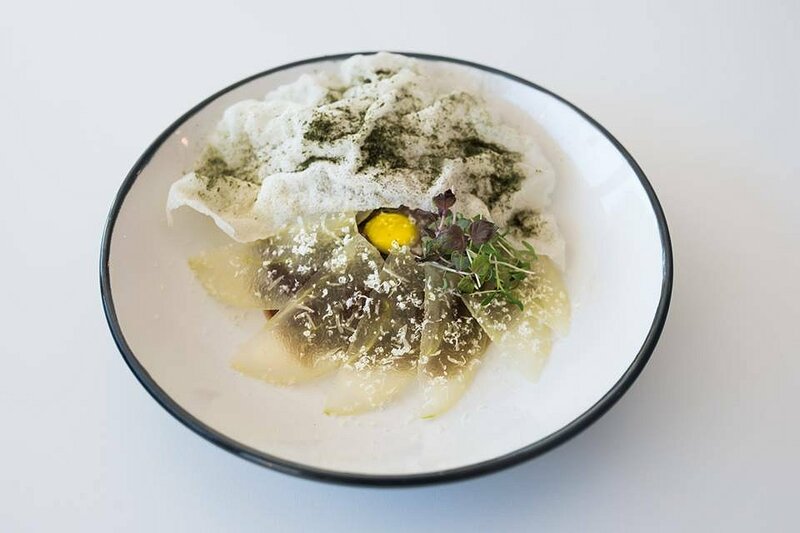 The next dish we tried was the Cod – nori, tapioca and toban djan. 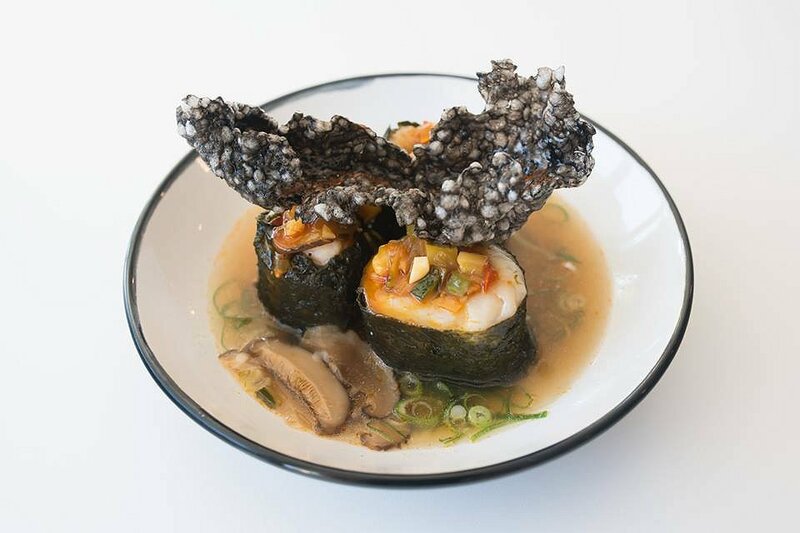 One of my favourite things about this dish was the way that is looked, like 3 giant sushi rolls. Wrapped around a large piece of seaweed was the delicious and subtle cod, topped with a rustic salad. The cod was then placed on top of a light miso broth which helped to give the cod that extra subtle salty flavour. 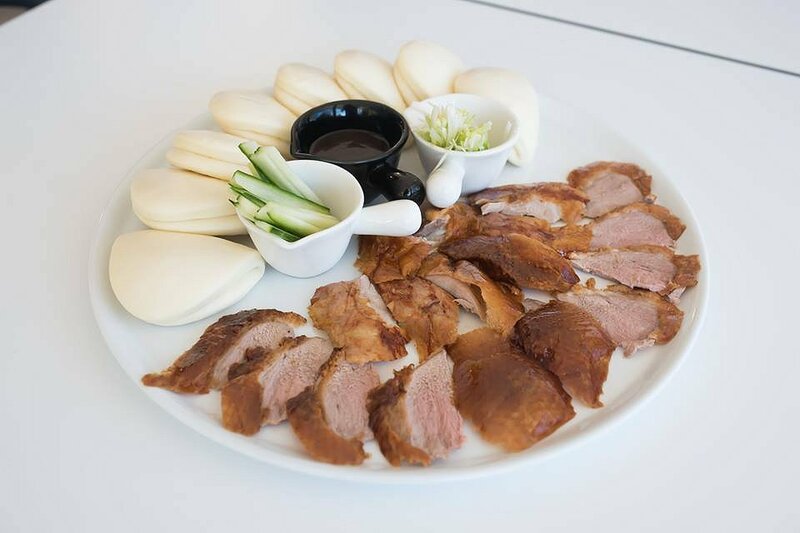 Now onto the famous Peking Duck with cucumber, spring onion with bao and duck noodles. This is one of my favourite dishes to order at an Asian restaurant. Usually peking duck is served with pancakes but at Bai Long they used baos, I really enjoyed this slight difference. 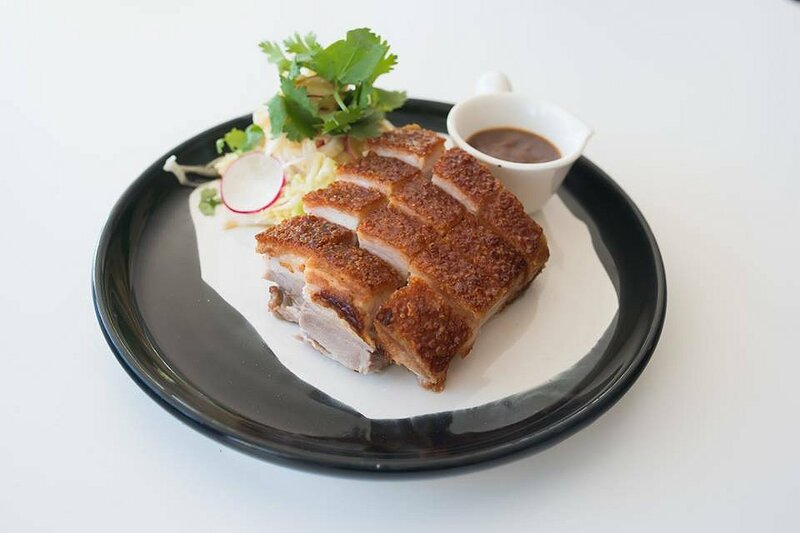 As always in a peking duck dish the hoisin paired well with the duck and fresh salad of spring onion and cucumber. Duck can sometimes be dry but the meat used was pink, tender and juicy. With the left over product a noodle dish was prepared for us, which was another highlight of the night. 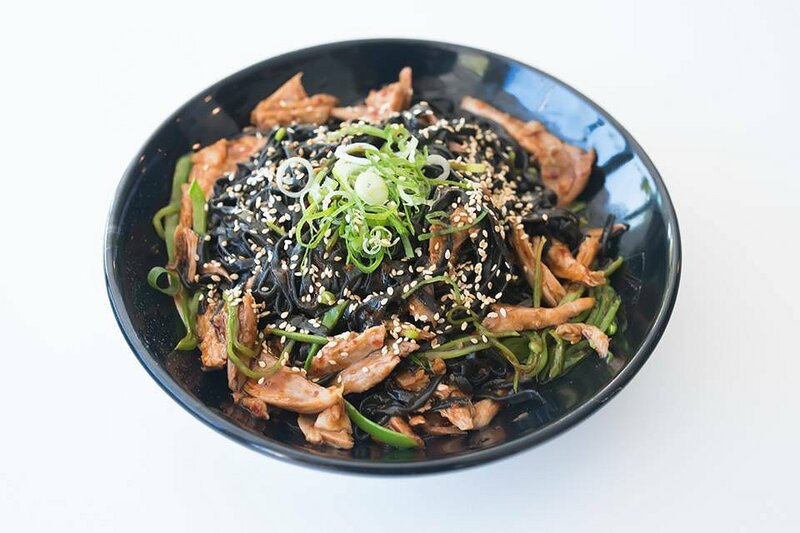 The noodles were black which usually indicates that squid ink has been used, yum. It is not often you see black noodles in an Asian restaurant, but it definitely worked and was a flavoursome combination. Another favourite of mine is the Crackling Belly – pickled vegetables, Sichuan sauce. This pork belly could not get any more perfect if it tried. The first thing that I look for in a dish like this is the crackling and how well it had been cooked. The crackling was not to salty and had just the right amount of crunch. I did not feel like I was biting into a chunk of oil, which can sometimes be a problem. The pork itself was juicy and not to fatty. The side of pickled ginger and Sichuan sauce was a wild addition as the flavours were both sweet and sour and complimented the pork belly. Now onto my favourite dish of the evening the Lamb – sous vide cutlets, soy caramel, onion. 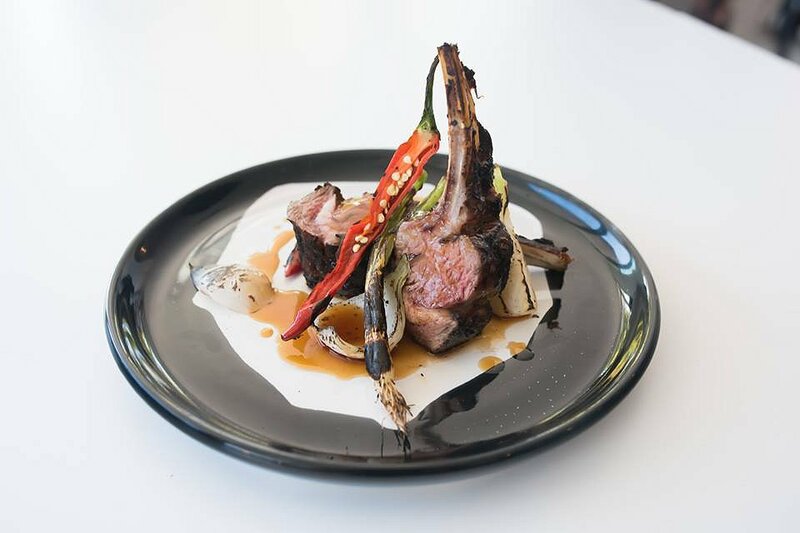 There is absolutely nothing to fault about this amazing lamb dish. The lamb could not be cooked anymore perfectly if it was tried, it was pink juicy and just melted in our mouths. The soy caramel that coated the lamb was subtle, but had just enough flavour to compliment the gamey lamb. I could honestly have just nawed on the bones all night, as the flavour was so extraordinary. We would love to thank Jerry and the staff are Bai Long for introducing us to their astonishing dinner menu. 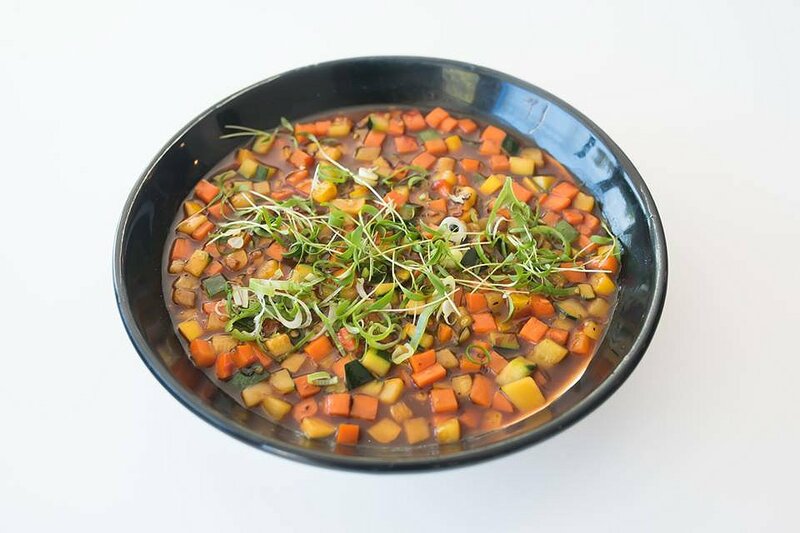 We were very impressed by the authentic ideas and we could see that a lot of thought had gone into the menu. Bai Long Store is open Monday to Saturday from 8am-9pm and Sunday from 8am until 3pm. Give them a visit, you will not be disappointed.